Parsons: Calling it "simple," he gives it a "B", 70/100. Michael5000: The twelve-pointed star really isn't especially simple, by flag standards, but it's a simple enough applique job for an accomplished Betsy Ross figure. I personally find this flag strangely unmemorable, almost generic. It doesn't do anything wrong, mind you, but neither does it especially stand out. Parsons: With "bad colours," it gets a "D", 40/100. Michael5000: It's been a while since I got to invoke the concept of "Josh Parsons hates Christmas," but here's a prime example. 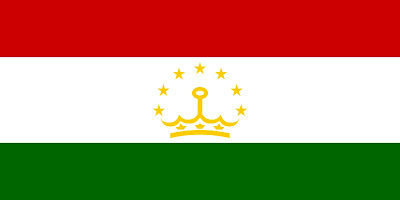 We've got red, white, green, and a somewhat fussy crown-and-stars motto in gold. The crown seems strange to me, as I don't really think of the Tajiks as a monarchical sort of society, but I'm no expert, but my point is, "bad colours"? I don't get it. They are such innocuous colours! Kind of nice, really! Parsons: Also with "bad colours," but it gets a more generous "B", 70/100. 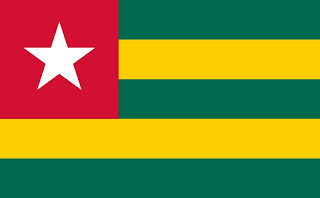 Michael5000: OK, this flag is a bit of an oddball, particularly in the African context. If you're like me -- and are we not all rather like-minded folks in this little community? -- you probably look at this one and think "Caribbean." But no. 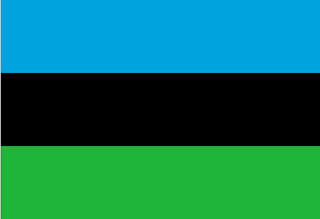 ...and Zanzibar, offshore islands that had a brief fling with sovereignty after decades as a British protectorate. Much as I like white stripelets, I seem to have a hard time loving gold stripelets. Parsons: Without any comment, it ends up with a "B-", 65/100. Michael5000: Of the many, many red-white-and-blue flags out there, this one stands out as a clean and distinctive design, striking and with no hint of fussiness. Somehow, I confess, it has never said "Thailand" to me, and I'm not sure why that is. But this gives me just a bit of a bias against it. Parsons: With "bad colours," it gets a "B", 70/100. Michael5000: There's nothing especially wrong with the colours, yet It is a truth universally acknowledged that Togo's flag is a bit of a clunker. Five stripes is a tricky number -- they are very thick stripes, but yet not the full fledged horizontal fields of a tricolor. Having the red field come an unusual 3/5 of the way down the flag, and then again to have it be a perfect square, are both odd features. Though composed of the simplest of geometric shapes, the whole thing has the effect of being strangely misshapen. I kind of like it for all that; as one of the ugly ducklings among the African flags, it at least has the virtue of being one of the easier ones to remember. 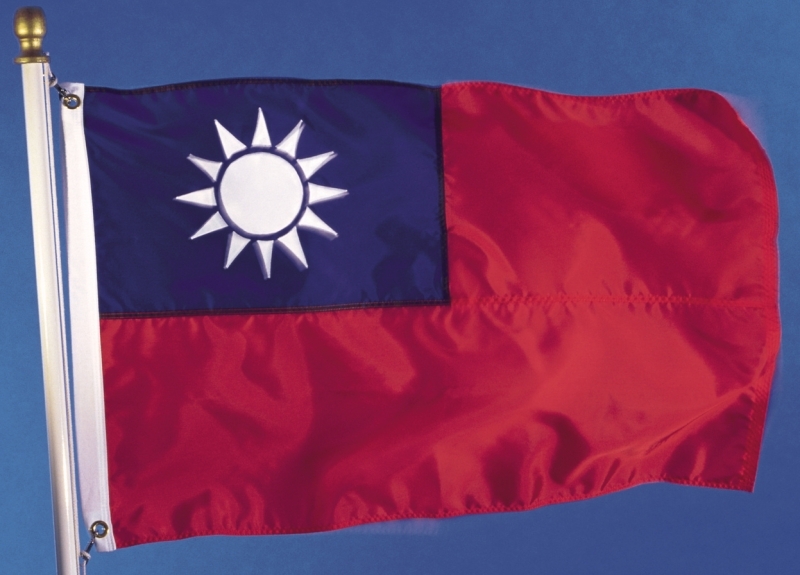 I remember when it was 'Formosa' and we had a big stand-off over Quemoy and Matsu....(before you were born, M5boy)...so I LIKE this flag. Simple and effective. A minus. So there! I've been away from this blog for several months - to catch up, I had to read the past Flag Fridays (as that and the quizzes are my favourite part, and I can't exactly enter the quizzes this late, can I?) But, I'm wondering, with South Africa to Sudan last week, shouldn't Suriname to Syria have come in already, or did I miss something (besides the lots of somethings I know I missed)? dh: Oh, good eye. It would appear that we jumped from Flag Friday XXXIV to Flag Friday XXXVI without the logical intervening step of Flag Friday XXXV! Egad! Well, that will be easily enough solved, next time Flag Friday comes around. I'm inclined to agree with you re: the Thai flag not being 'Thai' enough. But I think that's because within the country, the flag is less of a national symbol than it is the US. 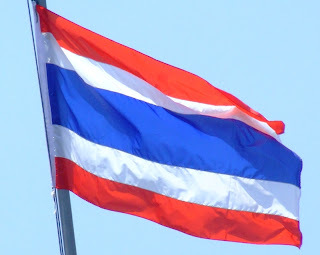 The symbol that says "Thailand" to me will always be the giant and/or prominent pictures of the king that grace billboards, sides of buildings and virtually every home or place of business I visited. But for what it is, I agree, it's clean and distinctive and a perfectly serviceable flag. 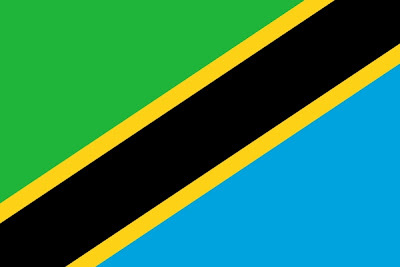 Tanzania's rocks! I heart diagonal flags!